A sunroom, also known as a patio enclosure, porch enclosure or lanai, is an inviting addition to any home. But like many other home fixtures, you must periodically clean and maintain your sunroom if you want it to look its best. Check out our handy guide full of useful tips on how to maintain a sunroom. You intended your sunroom as a space for enjoying the beautiful outdoor scenery and absorbing warm sunlight, so if its windows become covered in grime and dirt, it largely defeats the purpose. Because glass shows dirt so easily, you can clean the windows whenever they look cloudy or grimy. It’s more difficult to tell when frames are dirty, so aim to clean them once every few months. The most thorough cleaning should take place in early spring before the weather gets too warm and the hot sun bakes and hardens any existing stains or debris. Don’t put weight on your sunroom. When cleaning the exterior, don’t lean a ladder against the walls or windows. If parts of the sunroom are too high for you to access, consider renting scaffolding. Clean gently. Vinyl can scratch, so avoid using abrasive cleaners, including those containing bleach, chlorine and ammonia. Power washers can also be damaging. If you need to remove tough stains, a soft-bristled brush should do the trick. Avoid cleaning on sunny days. It’s best to clean sunrooms when it’s cool and cloudy. Maintain the surrounding landscaping. Surrounding trees and bushes can damage the exterior of the sunroom if you don’t trim them regularly. Tree branches can scratch the roof and windows, pollen can stain the windows and fallen leaves will clog up the gutters. Don’t walk on the roof. Many sunrooms feature glass not only on the side, but also on the ceiling. Never walk onto the ceiling of a sunroom, even if it’s a glass alternative. Check your manufacturer’s recommendations. 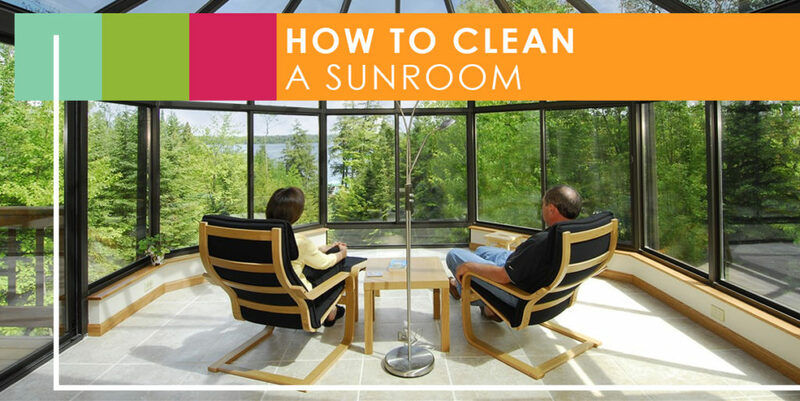 Some sunrooms, depending on the material, may have special cleaning requirements. Keep an eye out for leaks. Leaks allow moisture to enter your sunroom, which could then lead to mold — which can be a hazard to your health. If you see a leak, patch it up as soon as you can. 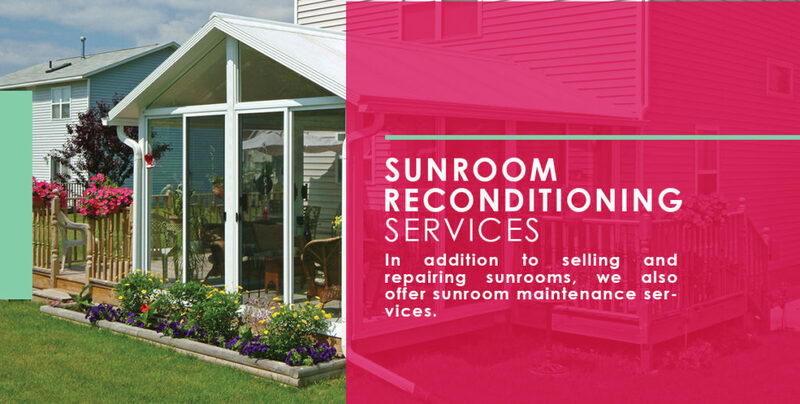 Sunrooms consist of various parts, all of which need regular cleaning. 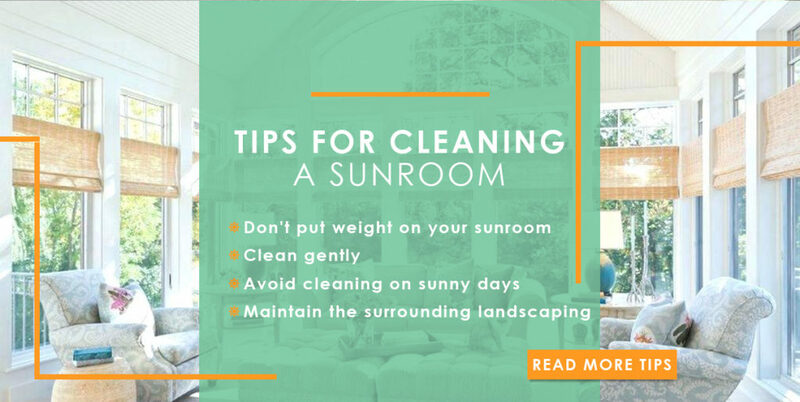 Read below for essential sunroom cleaning tips. Use a soft cloth or brush for vinyl surfaces. Avoid steel wool and scrubbing sponges, as they can do damage. You can easily remove light debris such as dust, dirt and smoke by using a mild detergent and some warm water. Don’t use solvent-based or abrasive cleaners, as these can also damage the vinyl. For the inside, how to clean sunroom windows is just like cleaning any other window. A glass cleaner such as Windex and a squeegee or soft rag will do the job. Condensation will lead to streaking, but you can prevent condensation by opening some windows and skylights while cleaning. Do not use razor blades, as you will risk scratching the glass surfaces. Exterior sunroom window cleaning takes more time, because more dirt accumulates there. The best way to clean sunroom windows is to start by removing as much debris as you can with a garden hose. Once finished, use a glass cleaner. If there’s still dirt on your windows, try applying mild soap, detergent, naphtha solvents or mineral spirits with a cloth, sponge or spray bottle. Allow the cleaning solution to sit for a few minutes, but don’t wait long enough for it to dry. Once you finish with a small section, rinse the area with clean water, then proceed to the next section. To dry the glass, use a lint-free cloth or a squeegee. Casement windows are the windows attached to the frame by hinges. 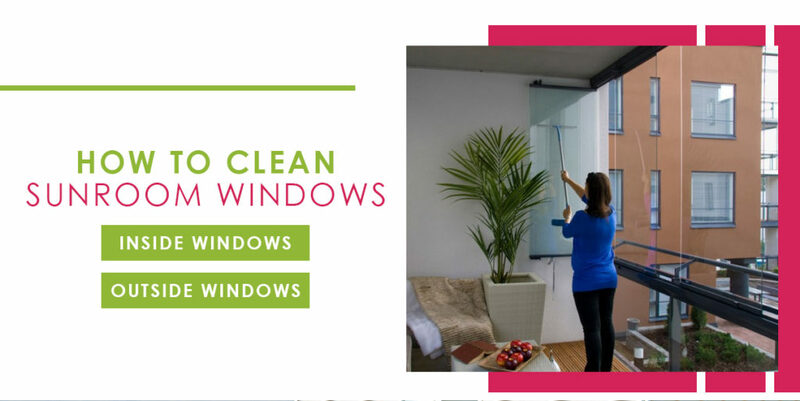 Clean them like other windows, but make sure you also grease the hinges with light oil at least every six months. The first step in how to clean sunroom window screens is to remove them. To do this, pull out the screens by disengaging the side clips, then place them on a level, clean surface and remove any dirt with a gentle brush. Make sure to thoroughly rinse and dry the screens before putting them back in. The door’s material is the primary factor that determines what cleaning method you use. Fiberglass: Fiberglass doors are exceptionally durable, as they will not rot, split, warp or rust. However, the finish can disintegrate over time. Regularly clean the doors by rinsing them with water and, if needed, a mild detergent. Steel: If the paint on your steel door is cracking or splitting, clean the door and then let it dry. Then, lightly sand the surface and add some paint so it matches the overall finish. If your roof contains aluminum roof panels, wash them with warm water and a brush to get rid of the grime and other deposits. Do not stand on the roof while washing. When you’re cleaning your sunroom, you want to make sure not to dislodge the weather seals attached to the windows and doors. If you notice a weather seal is out of place, slide it back into position right away, so it doesn’t get damaged when you close the window or door. If a weather seal does get damaged, replace it right away. It is essential to clean and remove debris from the gutters of your sunroom once every few months. Gutters on a sunroom can be different from those on your house in that they are sometimes installed level, which means water can accumulate. Regularly cleaning out these gutters will ensure your downpipes do not get clogged up. If you live in a colder region, you may want to think about installing heat trace cables in your gutters to prevent them from freezing. When cleaning out your gutters, do not lean ladders against them. Use a light machine oil to lubricate these moving metallic parts. The sealant around the windows of your sunroom doesn’t only help keep out moisture, but it also keeps mildew and mold from growing in difficult-to-access places. However, these seals begin to disintegrate over time due to old age and exposure to the sun. If you notice any mold or mildew around your seals or fogging between glass panes, it may be a sign that your seal is failing. If you catch the disintegration early on, the repair is easy: Add some silicone caulking around the area of concern, and this will protect it from more damage. However, if there is condensation between panes or mold or mildew has started to form, your best option is to replace the window. The framed windows and screens form the walls of your sunroom, and they must remain properly sealed to provide proper insulation and protection against pests. However, through age or misuse, the frames can bend and crack, which leaves openings for air, moisture and pests to pass through. Repairing these bends and cracks will largely depend on the material of the frame. The most common frame materials are wood, vinyl and aluminum. Wood frames need regular staining and treatment to keep them from splintering and breaking. If the wood does crack, you can get that part of the wood replaced. Vinyl and aluminum frames, on the other hand, do not need regular maintenance, but if a bend or crack does occur, this usually means you need to replace them completely. Sunrooms can only provide a comfortable, pest-free experience if the screens are whole and well-secured. However, screens often end up with holes, rips and tears due to old age, accidents and lack of proper maintenance. This damage not only affects the look of your sunroom, but it also provides an opportunity for bugs and rodents to enter. The type of repair you need will depend on where the rip or tear is and its size. Sometimes, if the hole is small, you can quickly patch it up with a melding kit, which you’ll find at most hardware stores. If the holes are larger, or if you have a tear on the side of the screen near the frame, you may have to replace the screen completely. The flooring for a sunroom varies widely and depends largely on the construction of the sunroom. Patio floors tend to be made of concrete and can crack and change color as time passes. If the floor is a wooden deck, it can splinter, fade and loosen over time. Even if you have covered the floor with carpet or a laminate tile overlay, it can tear, change color and wear. If the floor is a concrete slab, you may need to patch, repair or seal it. If your deck is wooden, sanding or staining it can keep it from further deterioration. If your floor is carpeted or tiled, you can tear it up and replace it altogether. You can also replace wall-to-wall carpet with an area rug. Sunrooms get regularly exposed to water vapor, both because of the water vapor present in the atmosphere and from normal household activities that create steam, such as cooking and bathing. Although you cannot detect this water vapor as it floats through the air, if it comes in contact with colder surfaces such as walls and windows, the vapor will condense and turn into water droplets. In traditional homes, open fireplaces, natural ventilation and the openings created by poorly fitting windows and doors allowed this water to escape. But newer homes, to conserve energy, have become better sealed, which makes it more difficult for water vapor to escape. While there are ways to minimize condensation, it is challenging to eradicate it. As lots of water comes into play when constructing walls, concrete and foundations, newly built sunrooms must have an opportunity to dry out. In the winter, this period will need to be longer. To reduce the amount of condensation that forms, you can provide natural ventilation by opening windows or doors. You can also keep out some vapor by closing the doors to the bathrooms and kitchen. 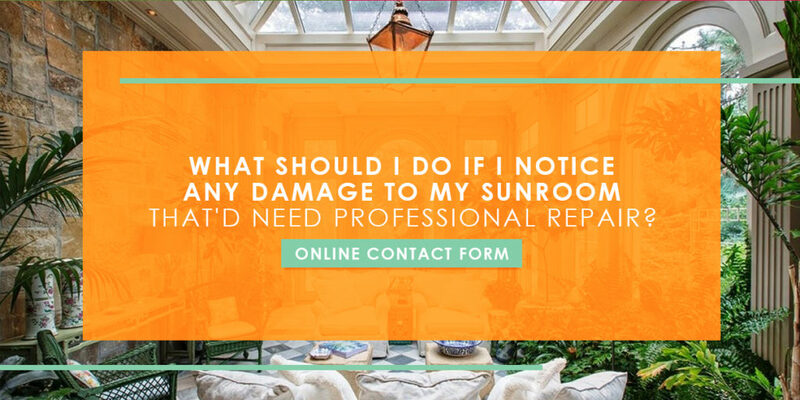 What Type of Sunroom Damage Needs to Be Professionally Repaired? Whether you need glass replaced, a crack fixed or structural damage repaired, contact us and our experienced technicians will happily assist you. They come equipped with all the necessary tools and materials and fix the problem quickly with minimal intrusion. If your sunroom has extensive damage — or perhaps you’re just interested in a sunroom with a different look — consider buying a new one from PA Sunrooms. We are Central Pennsylvania’s exclusive dealer of Four Seasons Sunrooms, a beautiful, high-quality brand of all-season sunrooms. We have exclusively sold these products for over 30 years and stand by their attractiveness, durability and functionality. Four Seasons offers a wide variety of styles, including deck enclosures, solid-roofed patios, glass-roofed solariums and stunning English-style conservatories. Regardless of your preferences, Four Seasons likely has a sunroom that suits your tastes and home style. Whether you’re looking for repairs, reconditioning or a new sunroom altogether, we will gladly assist you with any request you might have. 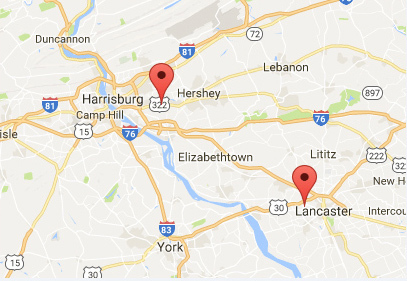 Use our online contact form or call us at 717-564-2244 to receive a free estimate or learn more about our services. How Long Does It Take to Build a Sunroom?